The major auction houses have known for some time that they are leaving significant money on the table with restrictive lot levels and emphasis on the high end property. The answer has and always will be on technology on the Internet. The first to figure out how to make buyers feel comfortable in this environment will set the trend and make a great deal of money. The risks for auction houses doing business at the top end of the art market look set to outweigh the rewards this year as the fierce competition for record-breaking works vies with wider economic uncertainty. Higher-volume, lower-priced business in the middle market could be the saleroom mantra for 2016. Christie’s and Sotheby’s, which have been responsible for some nine-figure public sales and hefty guarantees to consignors in recent years, are now channelling resources lower down the scale. Christie’s, in particular, is primed to attract “the broadest level of interest”, says Jussi Pylkkänen, its global president. He says that the auction house’s strategy this year is to reinvigorate sales in its “core market”, referring to works priced between $100,000 and $2m. Getting a higher percentage of sales through is a priority, “which may mean slightly more cautious estimates”, he says. Tad Smith, the chief executive of Sotheby’s, also highlights the middle market—which he defines as being between $25,000 and $1m—as an area of focus for 2016. The firm has previously seemed to steer away from these price points; in 2007, it closed its lower-value saleroom in Olympia, west London. Christie’s and Sotheby’s remain committed to the market’s top end, which Pylkkänen says would be “wrong to write off”, but it is easy to see why they will now be looking for higher-volume, more reliable revenue streams lower down. Against this backdrop, confidence levels in the $1m-plus art market have fallen, according to Anders Petterson, who runs ArtTactic, a specialist research firm. In his annual survey of confidence in the contemporary art market, which polled 123 art market professionals in January, 46% of respondents said they believed that its top segment will grow in 2016. Last year’s figure was 76%. In 2015, 5% of ArtTactic’s respondents thought that this area of the market could fall; this figure has risen to 21% for 2016. Works at the top end are costly to source and sell, with uneconomic sweeteners such as guarantees and heavy marketing costs being part of the “golden-lot” parcel for a small, and increasingly demanding, pool of clients. Intense competition between the two major auction houses eats into their profits—tinkering with the evening auction schedule seems to be the latest game—but beating each other at any cost is not a viable long-term strategy. The stakes are high: witness the $50m cash paid by Sotheby’s for an art advisory business in January, to gain quicker access to a powerful list of buyers. Posting a nine-figure price does not necessarily mean that the auction house itself has made more sales, either. At Sotheby’s, the sales total for 2015 ($6bn) was the same as for the previous year. Public auction sales at Christie's were also flat for 2015 ($6.5bn, down 4% in dollar terms and up 2% in pounds sterling). “Selling a $60m, guaranteed Picasso inevitably saps a huge amount of energy,” says Ed Dolman, Phillips’ chief executive. At Phillips, which focuses on fewer categories around the middle market’s price points, sales were up 34% in 2015, to $523m. Its average lot value was $107,000, which Dolman describes as “a very sweet spot to be in”. At the same time, selling works lower down the scale has become more efficient, thanks to the automated solutions that technology can offer. Osman Khan, the co-founder of Paddle8, an online-only auctioneer, makes a distinction between the “high-touch/low-volume” top end of the art market and today’s alternative business model; his firm’s target price area is between $1,000 and $100,000. Paddle8’s revenues for 2015 were up 100%, he says. Demand for art, it seems, is also on the rise. According to the Capgemini/RBC Wealth Management World Wealth Report 2015, the number of people with assets of more than $1m (known as the mass affluent) has grown by around 8% a year since 2009 and is forecast to grow at similar levels until 2017. But potential collectors in this group may find the “price of the entry ticket inaccessible” at the top end, says Petterson, so they are instead “starting to search for value in the lower and middle price segments”. The effect is already evident in the London salerooms this season. Both Christie’s and Sotheby’s are holding dedicated sales of Picasso’s ceramics (5 February). Volumes are high and prices can start below $10,000—and rarely reach six figures. These dedicated auctions have repeatedly been 100% sold, with considerable demand online. One challenge for Sotheby’s and Christie’s as they step on to their online rivals’ turf is that the latter charge lower commissions. Paddle8 applies a 15% premium to its hammer price, while Christie’s charges 20% between $100,000 and $2m and 25% up to $100,000. Sotheby’s charges 25% up to $200,000 and 20% between $200,000 and $3m. Pylkkännen says that lowering its premium to encourage volume is “not something we’ve considered”. 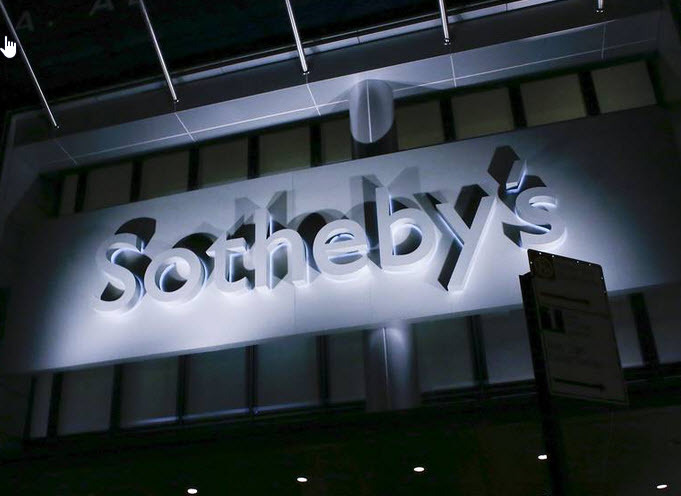 In a novel bid to expand the way auction houses do business, Sotheby’s said Monday it had agreed to buy a blue-chip art advisory firm in a deal that could be valued up to $85 million. The company—Art Agency, Partners—was started two years ago by former New Museum curator Allan Schwartzman and former Christie’s rainmaker Amy Cappellazzo. By branching into the art advisory business, Sotheby’s said it aims to position itself as an indispensable guide to heavyweight collectors seeking advice about ways to expand or retool their art holdings. Such advisory firms have proliferated in recent years. They serve as independent consiglieri to collectors, hired to help buyers navigate the opaque, high-stakes world of auctions, galleries and fairs to amass coveted artworks. Art Agency’s current clients include Dallas Museum of Art trustee Howard Rachofsky and Brazilian mining magnate Bernardo Paz, whose 5,000-acre park Instituto Inhotim is dotted with oversize art installations selected in part by Mr. Schwartzman, its creative director. The move is the latest salvo from Sotheby’s new chief executive Tad Smith, who wants the art house to offer clients services beyond the traditional business of buying and selling of art. Mr. Smith added that he wants to expand Sotheby’s expertise to include providing market intelligence, advising on potential purchases at other houses or helping organize exhibits of collectors’ works. The purchase also responds to an increasing pressure from the art world on Sotheby’s and rival, Christie’s International, to expand beyond their traditional auctions. Dallas Museum’s Mr. Rachofsky, one of Art Agency’s first clients, said he plans to continue his working relationship with Mr. Schwartzman, but said he’s still digesting the long-term ramifications—and potential conflicts of interest. Other art advisers remain cautious. Beverly Schreiber Jacoby, chief executive of BSJ Fine Art in New York, said she thought the deal might ultimately serve as a way for Sotheby’s to reassure investors after its recent lackluster sale of Al Taubman’s estate, and offer a buffer against a softening market. Sotheby’s share price has halved since June. However, on Monday, the deal helped boost the stock nearly 7% to $23.15. Sotheby’s acquisition comes two months after it offered voluntary buyouts and several weeks after Mr. Smith hired Marc Porter , another top deal maker at Christie’s. A new management hierarchy is also emerging, much of it led by newcomers to Sotheby’s. Under the house’s newly created fine art division, Mr. Porter will serve as co-chairman alongside Mr. Schwartzman and Ms. Cappellazzo. Mr. Porter will focus on expanding private sales globally, while the other two will work as advisers and oversee several specialist departments including impressionist, modern and contemporary art. Former investment banker and lawyer Adam Chinn, the firm’s third partner, is executive vice president of world-wide transaction support succeeding Mitchell Zuckerman, a 37-year veteran of the house who is retiring. An exhibition at Artcurial included comic books and a Mercedes-Benz 300 SL roadster. The bios and essays in Art+Auction’s guide to notable players in the art world will be rolled out on ARTINFO through the end of December. Here, we present an essay strategies pursued by smaller auction houses. Click here for an introduction to the entire series. Click here for previously published installments. Check back daily for new articles. As Art+Auction compiled its annual list of the 250 top auction houses around the globe—both large and small—this past summer, it became clear that smaller houses have been looking ahead and not only focusing their efforts on their regional art markets but also finding niches to exploit in the international art market at large. These houses are employing new business models—some tried-and-true strategies employed by powerhouses like Christie’s, Sotheby’s, and Phillips—and other experimental efforts to expand at a measured pace as opportunities present themselves in the evolving commercial art world. It’s no surprise that smaller houses have set their sights on Hong Kong, which over the past decade has become an increasingly important art world hub, powered by a rapidly growing collector base. This past September, under the guidance of Francis Briest and his partners, Artcurial of Paris held its inaugural Hong Kong event, showing off the house’s range with lots that included a gullwing Mercedes, paintings, comic books, and luxury goods. The sale found buyers for 85 lots and brought in a total of $8.1 million. The house also hopes to cultivate Chinese collectors interested in European furniture and objects of art from the 18th and 19th centuries. Asia is far from the only focus as these enterprises branch out. Artcurial, for instance, also established a new office in Munich, led by Moritz von der Heydte. Heritage Auctions in August jumped across the Atlantic to set up its first outpost in Europe through a new partnership with the Dutch house mpo Auctions. Heritage Auctions Europe, based in Amsterdam, will offer works across all 40 of the American house’s categories, including numismatics, in which they have built market dominance. Back in the United States, Marlborough, Massachusetts–based Skinner opened a New York office in May to maintain closer ties to its clientele beyond New England; at the helm is vice president and director of fine jewelry Victoria Bratberg. New York–based Doyle auction house—led by chairman and CEO Kathleen Doyle—recently opened an office in Beverly Hills to service West Coast collectors, dealers, families, and fiduciaries. The house already has branches in Boston; Washington, D.C.; Charlotte, North Carolina; and Florida. While many of these houses have added locations, they have also taken risks by expanding their category offerings. In October, Heritage held its first modern and contemporary art auction out of New York, led by the department’s new director, Leon Benrimon. The same month, MacDougall’s Fine Art Auctions in London held the first combined sale of Soviet and post-Soviet art, which realized $6 million, selling 95 of 177 lots. In mid September, Frederik Bruun Rasmussen, international director at Denmark-based Bruun Rasmussen Auctioneers, led the house’s first promotional sales exhibition in Paris, following a display in May at New York’s Collective Design fair. Other aggressive marketing moves include Dreweatts & Bloomsbury’s acquisition of Mallett Antiques late last year. Like Sotheby’s, Christie’s, and Phillips, small auction houses have also implemented new technologies to expand their offerings and their services to a growing audience of sellers and bidders around the globe. Chicago-based Leslie Hindman struck out on her own with a new online marketplace platform, LH Exchange, selling furniture and decorative arts on a buy-it-now basis. In September 2014, Brunk Auctions, Cowan’s Auctions, Leslie Hindman Auctioneers, Pook & Pook, Inc., Rago, and Skinner joined forces to create online auction platform Bidsquare. Its approach is not unlike larger aggregation sites such as Invaluable, but some smaller houses prefer to feel they have some input regarding what other types of auctions show up alongside them. Whether in the virtual or the real world, smaller houses are learning to balance a cherished sense of autonomy with the pressures of a changing market. 4. CLOSTER, NJ Sterling Associates of Closter is auctioning on Jan. 11 a powder horn believed to have been owned by Alexander Hamilton. CLOSTER — A powder horn said to have belonged to Alexander Hamilton sold for $115,620 Monday at an auction. The buyer did not wish to be identified, Stephen D'Atri, owner of Closter auction house Sterling Associates, said. The hammer price was $94,000 and the selling price was $115,620 with a buyer's premium, D'Atri said. The buyer won the bidding over telephone. This slain founding father has more fans than ever, thanks to a Broadway musical about his life and a debate over his place on the $10 bill. It's not clear what his plans are for the horn. "He sounded like an enthusiastic collector but I couldn't tell you," D'Atri said. Sixteen different bidders were angling for the horn, D'Atri said. Bidding started at $10,000. "We're pleased but not surprised," D'Atri said. "It really is a one-of-a-kind item." Warren Richman, a Clifton dentist, had owned the horn since 1990, when he bought it from a patient. He commissioned a Hamilton descendant, an appraiser and a handwriting expert to verify that the horn belonged to Hamilton. He also researched the symbols on the horn—a unicorn, a fenced-in estate, a roundel of sticks tied with rope and another roundel with cinquefoils—and believed each symbolized aspects of Hamilton's family history and aspirations. 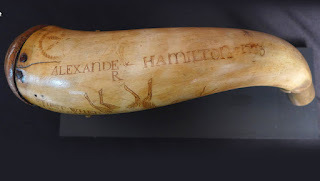 The cow horn is also engraved with Hamilton's name, the year 1773 and the words ""First when when [sic] came to Ohio." Hamilton would have carried a powder horn everywhere, though it's not clear if this was the powder horn he had when he was killed in a duel with Aarron Burr in 1804.